Shortbread always makes me think of my sister. Every Christmas, she makes a gargantuan batch of dough and proceeds to turn each cookie into a frosted work of art. I trust myself less with the decorations (yikes!) and more with the recipe. 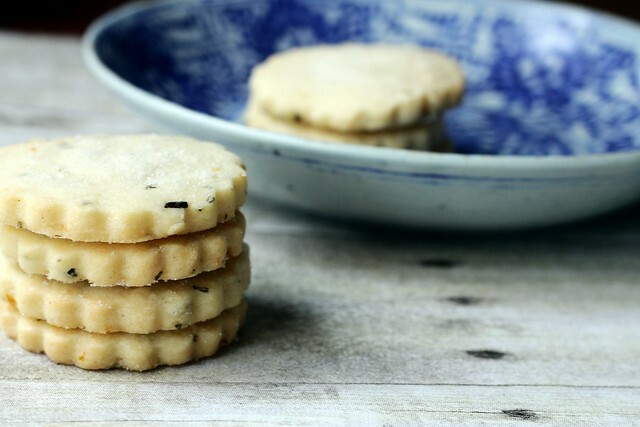 I was craving a traditional cut-out shortbread recipe that wasn't fussy, and it actually took me awhile to find one. I ended up coming back to my tattered Silver Palate cookbook. The first one. I remember so clearly my mom cooking out of that in the 80's, way before people even knew what pesto was. Or sundried tomatoes. Or roasting garlic, which seemed so crazy at the time. 40 cloves of garlic? Wild! Don't let the rolling intimidate you. This dough is really easy to work with, and the results are perfection. I added some fresh rosemary here. You can leave it out or add countless other (finely chopped) additions--lemon zest, pecans, hazelnuts, or almonds, Chinese 5 spice powder, lavender, candied ginger. Shortbread tastes even better if it ages for a few days, won't go stale for at least a week, and is so wonderful with a cup of tea in the afternoon. Cream butter and powdered sugar together until light and fluffy. Sift flour and salt together and add to creamed mixture. Add vanilla and blend thoroughly. Gather dough into into a ball, wrap in plastic wrap, and chill for 3 or 4 hours. Roll out chilled dough to 1/2" thickness. Cut into rounds or shapes with your favorite biscuit or cookie cutter. Sprinkle tops with granulated sugar. Place cookies on ungreased cookie sheets and refrigerate for 30-45 more minutes before baking. Preheat oven to 325. Bake for 20 minutes, or until just starting to color lightly. Cookies should not brown at all. Cool on a rack.